01 Rav 4 4wd had engine replaced under warranty by Lynch in 04 (47 000 miles on clock). Took car in last week as was making a terrible noise. Had taken it to Munro Exhaust who quoted me $950 for an entire new exhaust assembly. Took it to Meineke who after a thorough inspection advised exhaust perfect, but flex plate (flywheel) cracked and stiffner plate missing. Gave report to Lynch who also inspected vehicle and reported flex plate cracked but stiffner not missing and all torques correct. I asked how after 25000 additional miles this could happen to a quality car like a rav - I was told this can happen and is most likely due to poor materials. From what I have read and mechanics I have subsequently spoken to and who are now fixing the vehicle (as Lynch wanted almost double to repair it) the problem most likely manifested itself from the installation of the replacement engine by Lynch. Naturally Lynch dispute this and I guess there is no way to prove it, so I guess it is just a case of pay up and get on with it. Sure won't touch another Toyota vehicle again. So much for quality! Oh, yes I also paid for an extended warranty that expired literally a month or two before this problem arose. 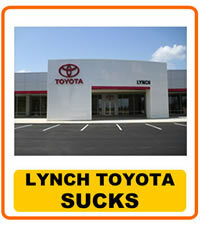 After lodging complaint with Toyota who informed me that I would get a call from the customer relations manager at Lynch, I have not heard a word. They basically wipe their hands of you.